Entertainment is in the Genes! My grandfather, Al Truszkowski Sr, was known was “Lefty Truszkowski” and had been famously known by his band “Lefty and the Polka Chaps”. 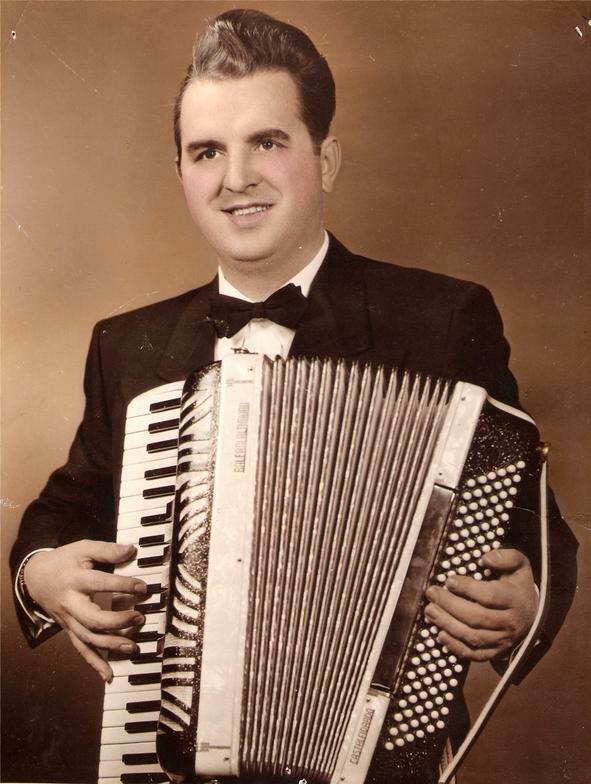 Lefty had the ability to make a living through providing entertainment by playing his accordion and using his talented vocals as the "Polka Pioneer" all throughout Pennsylvania for over 50 years. He was known as the “walking musical dictionary” because he was able sing and play any song that was requested of him. At a very young age and in the days of difficult coal mining life of Warrior Run, Pennsylvania, Lefty quit working in the mines and chose to support his family through music and had done so till his last breath. In the early 1960’s, Lefty’s band was the featured band on the popular “Polka Party” TV show on WNEP Channel 16 for several years. Lefty had written songs, both Polish and English, in which produced several records, and is especially known for “There’s a Christmas Tree in Heaven” and the “Anthracite Polka”. Lefty passed on the musical genes to my father (Al Truszkowski) and to my Uncle Pete, (Peter Truszkowski). My father formed his own band, “Jolly Joe and the Bavarians” and Uncle Pete formed his own band as well, “Pete and the Happy Knights”. Up until my father’s passing, Uncle Pete has played drums and accordion with my father’s band and has carried on the “Lefty” tradition of providing entertainment as a soloist singer/accordion player at local festivities and at nursing homes in the Wyoming Valley. My father, Al Truszkowski Jr., was known as “Jolly Joe” of “Jolly Joe and the Bavarians”. Jolly Joe also took after my grandfather’s talent of singing and playing the accordion, as well as other various instruments. Jolly Joe and the Bavarians was not only a unique band that played Polka and German style music, but especially catered to the crowds no matter what age group or nationality that was present. 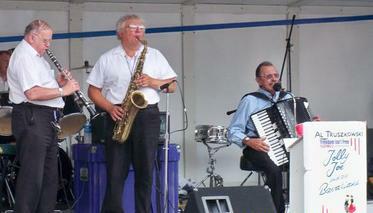 The band was hired throughout the country and in Europe, and played at engagements that paved the way to where polka bands normally did not get hired. Jolly Joe had the excellence to entertain and joke with his audience ranging from college campuses, Oktoberfests, weddings, picnics, private engagements, ball games, Musikfest, amusement parks, and nursing homes. 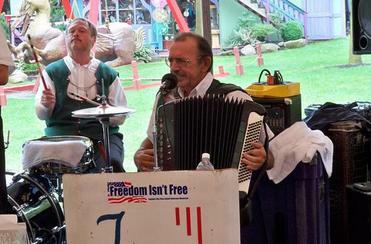 Jolly Joe and the Bavarians have produced several recordings and is widely known for being the first band ever in America to record “The Chicken Dance”. The future would be unknown as to how popular “The Chicken Dance” would become; after all, it was just a timeworn German novelty song before Jolly Joe brought it to fame in America. 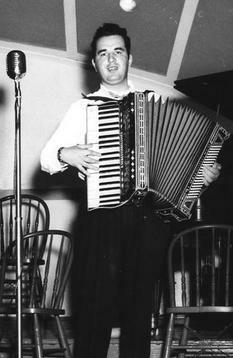 Jolly Joe had hosted his own original polka radio show for over 30 years, “Jolly Joe’s Bavarian Bandstand” on many local radio stations. 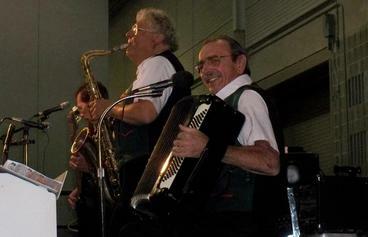 Being that “Jolly Joe’s Bavarian Bandstand” was on the AM dial and had started to be broadcasted on the internet, it was ranked as the number one most listened to polka radio show. During the time slot of the show, and with all the other channels/programs on the local AM/FM dial of Pennsylvania, New Jersey, and New York, the polka program was rated # 2 due to a soft rock station rated # 1 on the FM dial. Jolly Joe’s Bavarian Bandstand will always be remembered by its loyal callers with dedications/requests and by its listeners and countless sponsors. “Jolly Joe’s Bavarian Bandstand - often imitated, but never duplicated!” Throughout his 50 years of lively entertainment and his recording of “The Chicken Dance”, his spirit will never be forgotten. Lefty and his "singing accordion"
Professional photo shoot of Lefty for publicity.